I love white chocolate; if you ask me, it's always pumpkin o'clock somewhere. 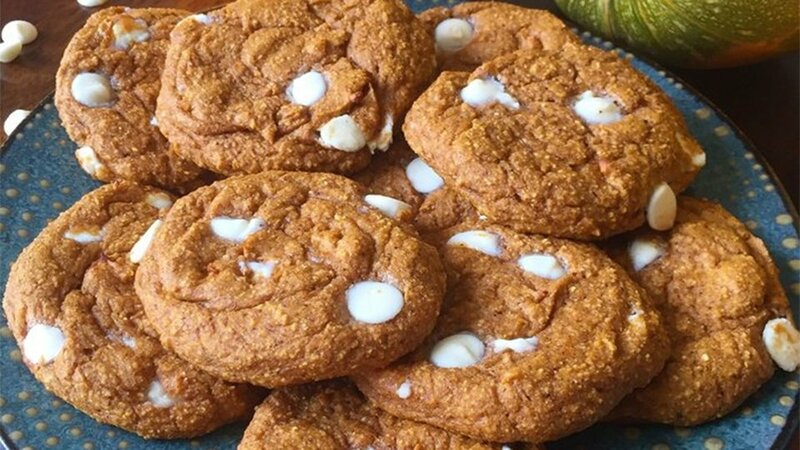 I can't resist the rich pumpkin and warm spices combined with melty white chocolate! I may or may not have eaten half the batch the first day. Luckily, half the batch totals only 390 calories. Did I mention these are full-sized cookies, about the size of the ones at Subway? Preheat oven to 350 degres F.
Whisk together dry ingredients in a medium mixing bowl. Mix in wet ingredients until smooth. Lightly spray a full baking sheet with cooking spray, then drop batter by rounded tablespoons onto sheet. Bake for 20-25 minutes until golden brown underneath and cooked through. I flatten my cookies with the back of a spatula right after they come out to make them chewier and less fluffy, but that's optional. Let cool 5-10 minutes and enjoy! Store any leftovers in the fridge up to one week or the freezer up to one month.